I have used a deep pink water-coloured patterned paper as a background on the left hand side of the card. I have stamped a patterned heart which I have then placed in the centre of the card. 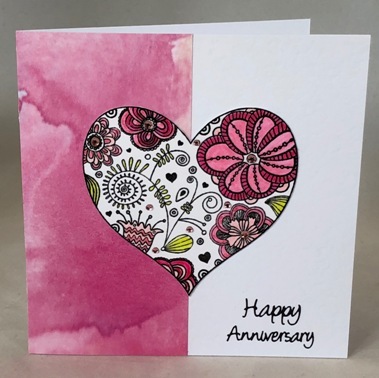 Having painted the heart in shades of pink and green, I then added some pale pink acrylic gemstones as embellishment and added the words Happy Anniversary in black lettering. The card is blank inside for your own greetings. If ordering by phone, please reference card #784.